Pollination is key to most foods that we eat. 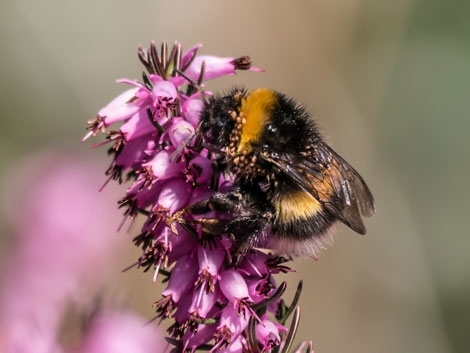 It's therefore a cause for concern around the world that bees and other pollinators are under threat due to loss of habitat, use of chemicals and disease. In Ontario, there has been a growing awareness amongst the general public and by socially-progressive corporations and businesses, about the importance of pollinators. Judith recently enjoyed attending a course New-pollinator Friendly Landscape Design: Why and How. She learnt about the top ten flowers sought after by Bees and about Bee habits and habitats. Pollination occurs when pollen is moved within flower or carried from one flower to another of the same species by birds, bats, other animals, or by the wind. This transfer leads to fertilization and successful seed and fruit production. Pollination ensures that a plant will produce full-bodies fruit and a complete set of fertile seeds, capable of germinating. Did you know that every mouthful of food is produced by bees pollinating crops: Flowering plants rely on bees for pollination so that they can produce fruit and seeds. Bees help pollinate fruit crops such as pears, peaches, strawberries and raspberries and vegetable crops such as cucumber, melon, squash, pumpkin and zucchini. The impact of flowering plants on the environment is important, helping to purify water and prevent erosion through roots that hold the soil in place and foliage that buffers the impact of rain as it fall to earth. Our water cycle depends on plants to return moisture to the atmosphere, and plants depend on pollinators to help them reproduce.